Philadelphia Museum of Art engagement picture. Having an engagement photograph taken at the Philadelphia Museum of Art is one of our favorite location for portraits of couples who are engaged. We love the architecture and surrounding city scene that always give us grand and beautiful photographs. We usually start at the grand steps of the Philadelphia Art Museum. The long steps at the museum lend itself for a romantic setting and depending where you have the couple situated, they can appear lost among the steps, but yet there are people all around. We then proceed to the entrance of the museum where we’re able to capture a private moment with them. An engagement session is all about capturing the love and affection a couple has for each other. 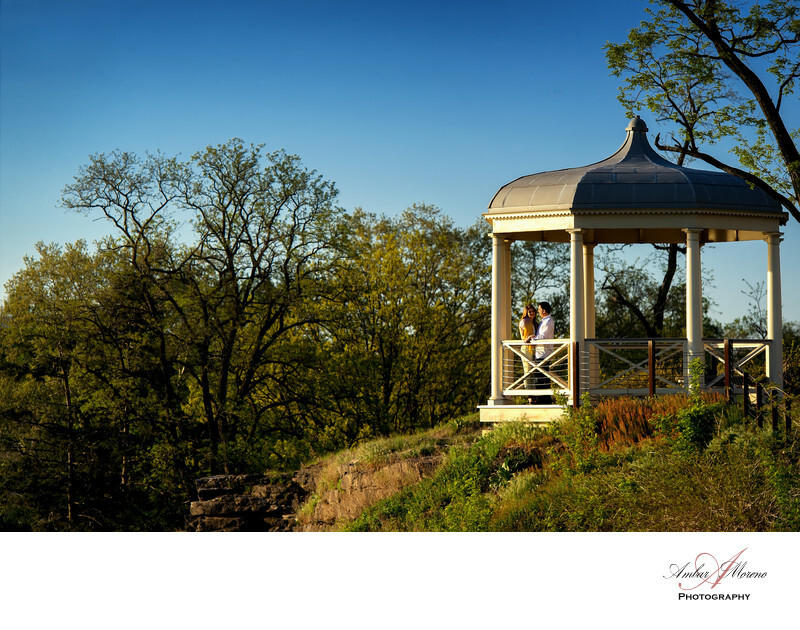 Just around the corner of the Museum there is a Gazebo and a wonderful vanish point that we enjoy photographing from as the couple interact inside the Gazebo, we’ll capture these special moments. These scenes become dramatic in nature as the sun begins to set. The sun will cast a beautiful golden light on the Gazebo and also on the couple, giving them a beautiful look upon their skins. This is when we begin to get creative with our photography and chose different looks, depending the lens we choose. This couple chose the Philadelphia Art Museum not only for its grand building, but also for the historic significance. There are so many isolated locations in and around the Museum that is just the perfect place for a couple to be photographed. The Philadelphia Art Museum is located at center city, Philadelphia, Pennsylvania. The Benjamin Parkway is also a great location to photograph our couple with the Art Museum as the background or the historic Philadelphia City Hall. We love how this couple demonstrated their emotion and affection toward each other. Capturing special moments between them were easy and plentiful. Setting them at the locations we wanted was all we need. We photographed so many precious moments. We used the scarf she was wearing to help make the ring stand out. Location: 2600 Benjamin Franklin Pkwy.